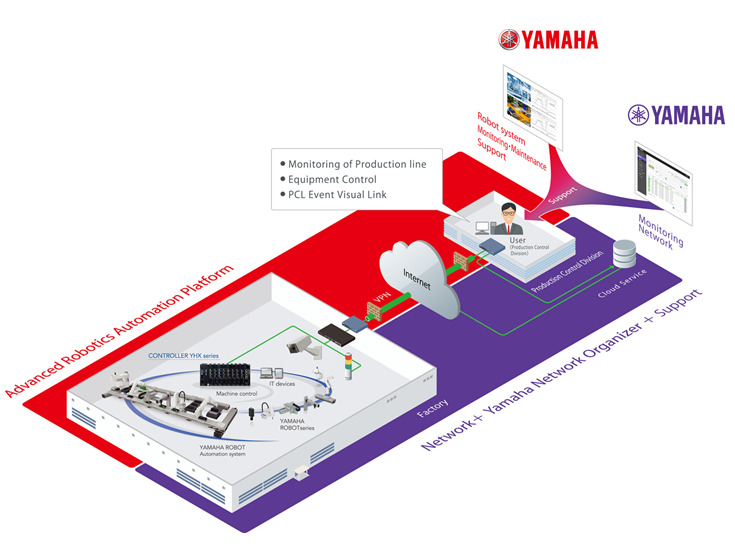 Joint Development of Remote Management System Packages for Factory Use IoT Platforms & Industrial Robots - Yamaha Motor Co., Ltd. Partnership with Yamaha Corporation for Full-scale IoT Business Entry- - News Releases | Yamaha Motor Co., Ltd.
IWATA, November 7, 2017 - Yamaha Motor Co., Ltd. and Yamaha Corporation announced today that they have joined forces in the development of remote management system packages for industrial robots. Utilizing the technology and experience that the two companies have cultivated to date, these packages are scheduled to be released in fiscal 2018. This alliance enables Yamaha Motor to make full-scale entry into the IoT business in the FA (Factory Automation) field. The remote management system packages to be developed through this partnership aims to provide factories using automated production lines with comprehensive management systems in the network-based monitoring and (as necessary) maintenance of industrial robots being operated remotely. By establishing stable end-to-end connections (factory to factory, and factory to manufacturer etc.) while maintaining a high level of security via VPN (Virtual Private Network) connections, this project aims to improve production line maintenance and operational precision, as well as significantly reduce man-hour requirements. It will do so by enabling the monitoring of remote images from production lines, sensor monitoring, traceability, and remote maintenance. These types of remote management system packages also include software and cloud services that accumulate, manage, and analyze images from monitoring cameras and captured data, as well as management systems for network equipment and peripheral devices which connect maintenance centers and factories. These packages are planned to be commercialized and sold by Yamaha Motor, and including this product, Yamaha Motor is aiming for sales in the FA business field of 30 billion yen by 2021. These packages will be exhibited at the “International Robot Exhibition 2017” to be held from Wednesday, November 29. This partnership venture combines Yamaha Motor's industrial robot technology - which has been cultivated over many years - with Yamaha Corporation's knowledge of network equipment, in order to provide new value for remote maintenance that is “Instant, Easy and Safe” in the rapidly-expanding FA market. As companies under the same “Yamaha” brand, Yamaha Motor and Yamaha Corporation have to date worked together on a wide range of initiatives, including design proposals and co-sponsorship of sports events with the theme of “Two Yamahas, One Passion.” However, this venture represents their first example of joint product development. Exhibitor: Yamaha Motor Co., Ltd.
Yamaha Motor's experience with industrial robots originated in 1976 with its first in-house manufacture of robots for motorcycle assembly lines, and has now developed into supplying advanced products to customers in a variety of fields such as the automobile industry, the electrical and electronics industry, and the food industry. The Company has a full line-up from single-axis robots to vertical articulated robots, which make a significant contribution to the automation of production processes. In 2016, Yamaha Motor released its “Advanced Robotics Automation Platform” that integrates and controls robots, peripherals, and operations, and is progressing its business providing overall optimization of production equipment. Founded in 1887, Yamaha Corporation manufactures a comprehensive range of musical instruments. From its beginnings in the manufacture of organs and pianos, the Company expanded further into manufacturing semiconductors in 1971 for the development of electronic musical instruments, furthering its growth in the field of electronics as well. In the network equipment field, since entering the router market in 1995 Yamaha Corporation has expanded its lineup of network products, and from 2007 has also sold conference microphone speaker systems. Notably, the Company has sold a cumulative total of more than 3 million router units to date, and won first place in the “Customer Satisfaction Survey - Network Division” published by the Nikkei Business Publication “Nikkei Computer” on September 14, 2017.